I one time took left over veggies from an meal and blended them up in an DIY recipe for making cat treats (Petunia loved the ones I made for her). Sometimes, if I have too much left over veggies, whether it's from an single meal or just veggies in the crisper drawer of the fridge that need to be used up soon, I'll save them back and use them in an soup. What a cool idea! Before doing so, make sure there's nothing poisonous in the batches. Some fruits and veggies can make pets sick or even kill them, like onions. Tonight was kind of a strange meal. I wok-cooked veggies in their own juices (mushrooms, bell peppers, onions, and spinach) and then added shirataku noodles, soy sauce, and balsamic vinaigrette! It was hearty and edible, but barely! I did save the leftovers because I'm totally the type that does not get rid of leftovers and MUST not waste them, so I'm stuck with it tomorrow! I finished the noodles so it is mainly the veggies, and mainly the bell pepper. Imagine this mixture but with almost all the noodles having been consumed. What would you add tomorrow to make it tastier? So in all seriousness, I am not sure since the base flavors of soy and balsamic vinaigrette are pretty strong. The only two things I can think of, and I really wracked my brain, would be to add a citrus flavor to it like lemon or lime juice. If you have mostly peppers left, why not make either a pasta salad, with the peppers, some other lightly flavored vegetables, and instead of dressing use some olive or avocado oil and a squeeze of lemon or lime. Or, make some sauteed cauliflower rice with salt and pepper in olive oil, cook some other vegetables like, pea pods (I think someone mentioned them) more onions and mushrooms, add some soy sauce and it's like a fajita over cauliflower rice. Cook the vegetables in toasted sesame seed oil to give it a really good flavor. I am stuck as to whether you should throw the peppers in because of the vinaigrette. The sesame oil and soy sauce could overpower it. Good luck. The sesame oil and soy sauce could overpower it. This would be a good thing. Not sure that this was conveyed. I really appreciate everyone's feedback on how to "dress" the leftovers. Sometimes reading it helps me understand flavoring and such. I ended up simply adding kidney beans to it. It certainly wasn't anything I'd repeat, but at least I was able to finish it! I went to a friend's home for dinner tonight. She served a whole head of cabbage and 3 bunches of spring onions that she had stir-fried in Bragg liquid aminos (2 TSP), curry powder, and 1 TBS natural peanut butter. I didn't want to insult her so I ate all of it but it was horrible. I don't know why. It was flavorless while at the same time being too salty. Have any of you cooked with Bragg liquid aminos as a replacement for soy sauce? Can any of you guess who this "friend" of mine was? Hint: she shares my address but isn't my husbutch. Lol not good. Yes I have used it. Such a different flavor than soy sauce. I use it occasionally, but prefer soy sauce. Not a fan so I only use it when there are a LOT of other flavors happening. Next time just throw some coconut milk, peanut butter and bit of chili sauce and then cook your goods. ( I mean your friend should) ETA and a splash of lime juice to the peanut sauce. I do have Bragg’s in the door of my refrigerator, but I use tamari a lot when I cook for friends because it’s gluten-free. Parboiled 2-3 cups of cubed potatoes (yukon & garnet). Drained well. Added a bit of coconut oil (or use Vegan butter, if you like!) to pan and fried potatoes til a little golden brown then added some green onion. Then sprinkled in cumin, turmeric, smoked paprika and garlic powder (to taste). Cooked for another 5 minutes and then added some crispy coconut bacon. Then a minute or two before i took it off the stove & added some halved cherry tomatoes and let it cook for another minute or so. I served it on a bed of spinach and added additional sliced cherry tomatoes and green onion & applesauce on the side. really nice! Tonight I tried making nachos with daiya "cheese" and really was not fond in the least. I do enjoy daiya on pizza. I used whole grain rye crisps and green salsa, two items I always love, but the daiya just did not work flavor wise with them. It almost tasted kind of bitter instead of light and sweet, or something like that. Any suggestions for making tasty vegan nachos? Cuz I'm all about nachos. 1) Add potatoes and carrots to a pot of water. Bring to a boil, and let boil for 10 minutes. Strain and add to a blender. 2) Blend together the potatoes and carrots. They don't have to be perfectly blended - just break them down a little. 3) Add in remaining ingredients for the nacho cheese and blend until smooth and creamy! 4) Drizzle over tortilla chips, in a bean burrito, or whatever your heart desires. Our vegan for more than 30 years friend swears by daiya for shredded cheese, but Pete isn’t crazy about it. She likes chao original for sandwiches. When we make it’s a work night pizza, she puts chao on her pizza. We are serving vegan Mexican food for guests tonight, and Pete bought vegan sour cream. Thanks for the feedback, folks. I am thinking I can also try to think outside the box a bit. Basically for nachos, I would like something kind of soft and pleasantly flavorful but light since green salsa is strong- so maybe I need to consider replacements to even vegan cheese as well. Mashed avocado might be nice, although avocados are sometimes hard to find at just the right consistency. I know me, and I know I don't do complicated recipes, not that they are not helpful to read because sometimes I can think of a way to simplify. I need super simple. I like vegan sour cream a lot, though I rarely get it because it doesn't feel like a necessity. It sure would be fun at a party. What are you serving for your Mexican vegan party? I would love to hear about any use of beans especially. You all probably know about “Bitchin’” sauce, but I bought some for the first time this weekend from Costco. It is vegan and made from Almonds, grape seed oil and almond milk, aminos, as well as super tasty seasonings. Original, curry and spicey hot flavors...good for dipping chips and veggies, add some to chickpea pasta, spread on a sammie, yumbolicious! They were selling 3 tubs for around $9 in the refrigerated section. this fried rice is quite good and hits the spot! Delicious vegan shiitake fried rice recipe. For dried mushrooms, add the shrooms to a bowl and add 2 cups water. Let it sit for 20 minutes. Drain and slice into pieces. Set aside. For fresh mushrooms, simply rinse and slice into pieces. Set aside. Heat a pan over low-medium heat. Add canola oil. Once it's hot, add ginger + garlic + onion. Stir and saute until the onions are translucent. Add the sliced mushrooms. Stir and cook for 4-5 minutes over the same low-medium heat. Add soy sauce, vinegar, vegan oyster sauce, salt, pepper, paprika, and vegetable broth (if using). Stir and cook for 2 minutes (4-5 minutes if you're using veggie broth). Next, add the cooked rice and mix well. Transfer to a serving bowl, dash of Tabasco, dash sesame oil, garnish with freshly chopped parsley/cilantro/green onion + toasted sesame seeds and serve. So the beans were extremely easy and delicious. I soaked about a pound of dried pinto beans overnight, rinsed them in the morning, and covered them with 7.5 cups of water in the crockpot. I have a very basic crockpot so I put them on low, but they weren’t getting soft enough, so I put them on high. I never add salt when I make beans because it’s supposed to make them tough. I did add cumin and chili powder. I seriously think I’ve never cooked them enough before. I’m sure there are thousands of recipes online, but this is something I just did, and it legit was super easy. I cook a lot and I’m not especially stingy with myself but if I have to buy too many special ingredients that I can’t imagine using again any time soon, I just don’t bother. For breakfast I had rice, nice soft pinto beans, eggs, a small avocado, and corn salsa. ETA The beans took all day to cook but you don’t have to do anything to them while they cook. Pour wet ingredients into flour mixture. Mix til just combined. Do not overmix! Let batter sit for 10 minutes while you heat griddle. Put a bit of coconut oil into pan. Cook pancakes til bubbles appear all over pancake. Flip. Keep warm in oven til all done. Serve with coconut yogurt/vegan butter. Top with maple syrup and pumpkin seeds. If any left freeze between wax paper. Toast or warm in oven. Amazing. haven't tried out this one yet, but it sounds great! In a large non-stick pan on medium heat, add 1 tablespoon of coconut oil. Once the oil is melted and the pan is hot, add 1 diced onion, and 1 diced red pepper. Cook the onion and red pepper until softened, about 5-6 minutes. Add 1 cup thawed frozen peas, and 2 tablespoons vegan oyster sauce to the pan, and sauté for 1-2 more minutes until all of the veggies are coated and the peas are heated through. Transfer the mixture to a bowl and reserve. In the same pan on medium heat, add sesame oil and turmeric powder to the pan. Next, add the cooked brown rice, and sauté it in the oil and spice for a few minutes, or until just warmed through. Add ¾ of a cup of toasted unsalted cashews, and 4 tablespoons of the liquid amino acids, and stir until the rice and nuts are thoroughly coated with the amino acids for 1 minute or so. Note: I did jig the recipe a bit to my taste. Some of the seasoning was pretty intense. I discovered an new non-dairy, sugar free creamer to use, recently. 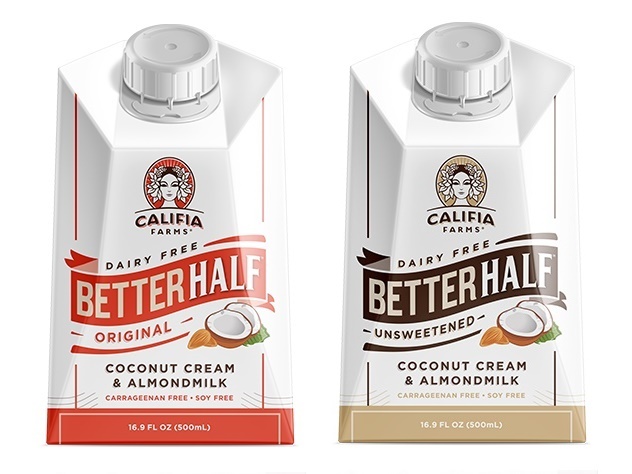 It's made by Califia Farms and it's half coconut milk and almond milk. I use it in an cup of hot cocoa, or with an cup of decaf coffee, or over oatmeal, or use it in my Burt's Bees Protein shake mix (vanilla).